The story behind our recent paper “Heat Oscillations Driven by the Embryonic Cell Cycle Reveal the Energetic Costs of Signaling” Developmental Cell, 48(5), pp.646–658.e6. At the end of 2014, a friend asked me “What is your story”? I had just started my postdoc in the laboratory of Karla Neugebauer and was a bit perplexed by the direct question. I started talking about some loose project ideas of mine involving words like development, metabolism, and RNA – after all, I joined an RNA lab after doing my PhD on fly development, growth control, and lipid metabolism. But the story behind our paper did not start for another few months. Historically, metabolism and developmental biology are deeply connected. This was emphasized in Joseph Needham’s mammoth three-volume work “Chemical Embryology” published in 1931 on the subject of physico-chemical embryology. This research faded away since the molecularization of experimental embryology, but over the last few years has reemerged as a quantitative field of study in developmental biology. Two consecutive meetings, the 2016 Company of Biologist Workshop ‘Metabolism in Development and Disease’ and the 2017 EMBO Symposium ‘Metabolism in Time and Space’ (Krejci & Tennessen 2017), highlighted that developmental biologists are once again investigating the role of cellular metabolism in growth, differentiation, and maturation during development. This resurgence of metabolisms role in development sets the stage for our story. Developing embryos, like all living systems, are open systems exchanging energy and matter with their environment. They function out of equilibrium and require a continuous supply of energy to remain alive. From a thermodynamic perspective, metabolism can be regarded as an energy converter that directs energy from nutrients through an interconnected web of chemical reactions to meet the energetic and biosynthetic demands of growth, proliferation, and development. An emerging view is that this bioenergetic function of metabolism is tightly regulated in time and space in order to fulfill the changing energetic and biosynthetic demands of animal development (See Miyazawa & Aulehla 2018 and Gándara & Wappner 2018 for reviews). One particular example is that highly proliferative cells exploit increased glycolytic activity even in the presence of oxygen – a metabolic state known as aerobic glycolysis or the Warburg effect (Ward & Thompson 2012). How and why cells adopt this metabolic state has been the focus of intense research in the last decade and is not entirely understood. It has been recognized that this metabolic wiring supports the increased energetic and biosynthetic demands necessary for rapid cell growth and proliferation during development and disease. Indeed, implanted mammalian embryos seem to utilize Warburg metabolism with high levels of glucose uptake, glycolytic activity, and lactate production. Interestingly, early embryos undergoing rapid reductive cleavage divisions do not rely on glucose but rather use pyruvate, lactate and amino acids as energy sources (Gardner 1998). This indicates that early embryos rely on respiration to proliferate and switch their metabolic state during the transition from the cleavage to the blastocyst stage. This metabolic switch seems to coincide with the transition from maternal to zygotic instructions of developmental control known as maternal-to-zygotic transition (MZT) when maternally deposited RNA is degraded and zygotic gene expression is initiated. Karla Neugebauer’s laboratory at Yale University focuses on the regulation of transcription and splicing in a variety of biological contexts, including MZT. When I joined the lab, RNA-interactome studies had just identified many ‘classical’ metabolic enzymes of intermediary metabolism as RNA-binding proteins and I was intrigued by the idea of combining expertise with the Neugebauer lab to study the dynamic interplay between transcription, RNA-binding proteins and metabolism during early zebrafish embryogenesis, particularly during MZT. Although this was the original idea for my project in her lab if you’ve read our paper you know that we ended up elsewhere… using calorimetry to measure the heat flow between a developing embryo and its surroundings. How did the project change so drastically? Stay with me, as I will explain in the next few paragraphs. The change in a metabolic state is usually associated with a change in the energetic and biosynthetic requirements of the system under investigation. In the case of embryonic cleavage stage development, cells lack growth phases and thus become smaller as they divide. One could hypothesize that they use oxidative phosphorylation because of the absence of volumetric growth. However, increasing embryonic cell number demands precursors (e.g. nucleotides, fatty acids, and amino acids) for DNA replication, an increase in plasma membranes, and protein synthesis. Thus, the embryo must produce and/or polymerize the precursors necessary for cleavage stage development. Each cell of the embryo must also expend energy to assemble and disassemble cellular machinery (e.g. chromatin, mitotic spindles), generate forces needed to segregate the chromosomes and divide the cell, and change the activity of signaling pathways that enforce cell cycle phasing, even in the absence of volumetric growth. As development proceeds and the embryonic cell cycle gains G1 and G2 phases, the embryo faces the additional energetic demands of volumetric growth and might switch to aerobic glycolysis as a metabolic strategy to fulfill those. But what are those energetic demands? I realized that we lack a quantitative understanding of how the metabolic energy converted by different metabolic states is partitioned among the complex array of cellular processes that take place during cell growth, proliferation, and development. What if we could put numbers on energetic requirements of making a new cell or an embryo? Maybe then we will be able to understand why metabolism functions the way it does. I became fascinated by the thought of studying the energy budget of early embryogenesis and my focus shifted away from the regulation and interplay of RNA biology and metabolism during MZT. This is where our story truly started – with the question of how to measure the energy required for embryonic development. The amount of energy dissipated by an animal per unit of time is defined as metabolic rate and is reported in energy units per unit time in Watt (joule/second) or Watt per kg body mass (W/kg). An average human at rest consumes ~2000 kcal per day and dissipates energy in the form of heat at a rate of about 100 W or 1 W/kg (Joules/s*kg). These estimates are conceptually based on the first law of thermodynamics. The change in energy (2000 kcal /day) equals heat dissipated (100W) minus work. The average human is at rest – not growing or conserving any energy – and does not perform any net chemical synthesis or anabolic reactions. All the 2000 kcal/day is converted by catabolic reactions and immediately used by various cellular processes defined as maintenance reactions to keep the individual alive or away from thermodynamic equilibrium. Now let’s consider a growing organism which must perform anabolic reactions and invests energy into chemical synthesis of new biomass in order to grow. In this case, the organism conserves energy and performs net chemical synthesis. Measurements of heat dissipation now reflect the difference between energy consumption in the form of nutrients and energy conservation by biosynthesis, which is equal to the net change in enthalpy of all the reactions taking place in the system. This is how heat dissipation differs from respiratory metabolic rate measurements such as O2 consumption or CO2 production. They reflect rates of catabolic reactions and are inherently blind towards energy conservation in the system by anabolic reactions. Heat dissipation is directly connected to the laws of thermodynamics. When approaching this question, I thought, “maybe we can measure the heat flow between developing embryos and their environment using calorimetry.” It’s also possible that I always wanted to stick a developing organism in a calorimeter to see what I could measure… Isothermal titration calorimetry (ITC) is traditionally used to measure the heat transfer associated with a biomolecular interaction to determine the binding constant, stoichiometry, enthalpy and entropy of the binding event in solution, without the need of labels. After spending a few weeks of optimizing a 17 years old ITC machine housed in the biophysical core facility into measuring heat flow for prolonged periods of time without titrations, we were ready to try to measure the heat flow associated with early development. It worked incredibly well – and I was thrilled when I saw the first heat flow data from early zebrafish embryos undergoing cleavage stage development (see picture). 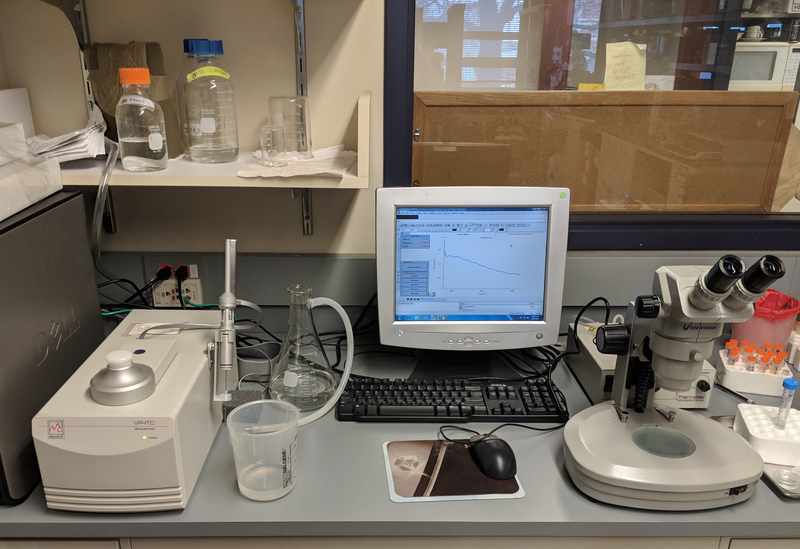 Isothermal calorimetry set up used to measure the heat flow between zebrafish embryos undergoing cleavage stage development and their environment. Not the actual first experiment. #mymachinewithoutme. The initial finding was that the heat flow between embryo’s undergoing cleavage stage development and their environment increased over time. Surprisingly, however, I discovered that there was a small (~2% of the mean) but reproducible heat flow oscillation superimposed on the steady increase. The period and number of oscillations matched the division cycles taking place during this phase of embryogenesis. The oscillations suggested the presence of cyclic energetic events associated with embryonic cell proliferation, leading us to wonder if the oscillations are associated with the embryonic cell cycle. After the initial discovery, I started a collaboration with Joe Howard, a biophysicist, to tackle the theory and thermodynamic aspects of heat flow during embryonic development. In the summer of 2015, Joe was invited faculty for the physiology course at the Marine Biology Laboratory (MBL) in Woods Hole, Massachusetts. We decided to take the project to the MBL for two weeks and I had the pleasure to work with two amazing students on the energetic costs of embryonic development. Manuel Razo was interested in the temperature scaling of the heat flow and Mathijs Vleugel started to investigate the underlying metabolic state and mitochondrial biology of embryos undergoing cleavage stage development. The two weeks at the physiology course and the MBL deeply influenced my thinking about the energetics of development and science in general. The course brings together scientists from diverse backgrounds and provides a truly collaborative and open environment. We started to throw ideas around and discussed what these heat flow oscillations could be? As the early embryonic cell cycle is solely composed of DNA replication, mitosis and cytokinesis, a prediction was that these heat flow oscillations could represent the energy used by either of those processes. My personal bet was on mitosis – but it turned out we were all wrong. The experiment which pointed us in a new direction was when I blocked both DNA replication and mitosis by inhibitors. To our surprise, the heat flow oscillations persisted with a similar period and amplitude as control treated embryos. What followed was a series of quantitative heat flow measurements combined with perturbation experiments, theoretical modeling, and order of magnitude estimates for energetic costs of oscillatory cellular processes to investigate the underlying principle of the heat flow oscillations. We were able to show that they were driven by the phosphorylation and dephosphorylation reactions catalyzed by the cell cycle oscillator, the biochemical network controlling mitotic entry and exit, and thus revealed the energetic costs of cell cycle signaling. In summary, the story started with an unconventional idea and a discovery. It evolved to show that quantitative heat flow measurements combined with perturbation experiments, theoretical modeling, and order-of-magnitude estimates can be a powerful approach to dissect the energetic costs of various cellular processes driving embryogenesis. In our work, we postulated that the energetic cost of cell cycle signaling likely reflects the thermodynamic burden of imposing accurate and robust timing on cell proliferation during development, as predicted by a theoretical tradeoff between energy dissipation and precision of biomolecular oscillators. I am currently working on establishing systems to measure the accuracy of the embryonic cell cycle and modulate the oscillatory heat flow amplitude and phase to test these in-silico predictions in-vivo and in-vitro. Furthermore, we have been able to allocate the oscillatory component to the energetic cost of the cell cycle signaling representing 2% of embryos total energy expenditure. What about the other 98%? Why does it increase during cleavage stage development – even absence of volumetric growth? Gardner, D.K., 1998. Changes in requirements and utilization of nutrients during mammalian preimplantation embryo development and their significance in embryo culture. Theriogenology, 49(1), pp.83–102. Gándara, L. & Wappner, P., 2018. Metabo-Devo: A metabolic perspective of development. Mechanisms of development, 154, pp.12–23. Krejci, A. & Tennessen, J.M., 2017. Metabolism in time and space – exploring the frontier of developmental biology. Development (Cambridge, England), 144(18), pp.3193–3198. Miyazawa, H. & Aulehla, A., 2018. Revisiting the role of metabolism during development. Development (Cambridge, England), 145(19), pp.dev131110–11. Ward, P.S. & Thompson, C.B., 2012. Metabolic Reprogramming: A Cancer Hallmark Even Warburg Did Not Anticipate. Cancer cell, 21(3), pp.297–308.